One of my friends bought an iPhone a few months back and got excited about it. But, when he tried to transfer all the data from his old Android to the new iPhone, he lost all his excitements about the new iPhone. He tried his own and other ways mentioned in various sites, to transfer his contacts and other files and valuable data, but none got succeeded. So many of the new phone buyers got into this trouble and particularly the gadget freaks, who exchange their Phones to get the new arrivals in the market. Is there any good tool available to do this trick easily? 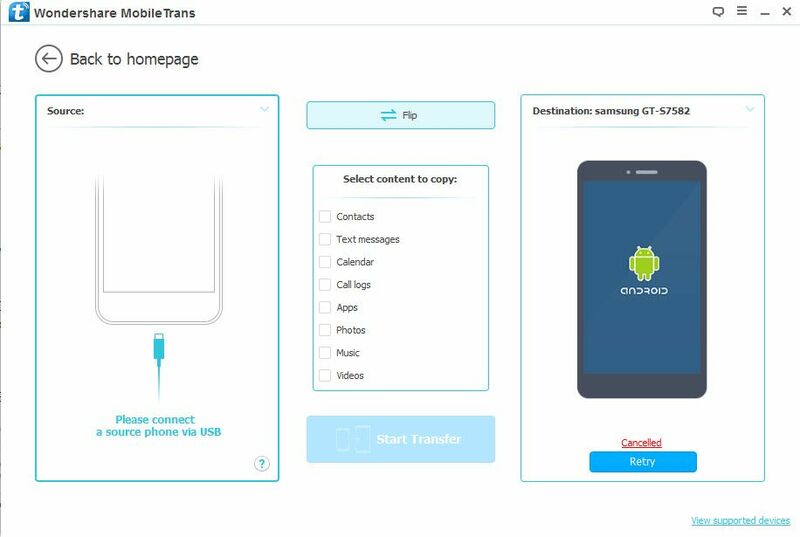 Here we found a tool called “MobileTrans” by Wondershare which promised the Mobile to Mobile Data transfer in an easy way. Wondershare Mobile Trans tool is very simple and easy for anyone to do the transfer between two Mobiles. MobileTrans tool can transfer Contacts, Messages, Calendar, Photos, Music, Videos and Call logs in a simple one click. They support transfer between Android, iOS, Blackberry and Symbian platforms. MobileTrans are not stopped with the Phone to Phone transfer, other than that they are providing some extraordinary services. You can transfer the Phone Data to the PC and can transfer it later to another Phone. Not only that, you can transfer the Backup data to your Phone. Currently, they support a transfer of backups from Samsung Kies, MobileGO, Blackberry Desktop Software, iTunes, iCloud. You would definitely love to transfer from iTunes playlist to Android, iPhone, iPad or iPod with Mobile Trans tool in a flawless way. Let’s see the Mobile Trans into deep. How to Install and Use MobileTrans in Windows or Mac PC? The installation procedure is very easy with Mobile Trans. Just download the Setup file and run it. You can try the limited Trial version before you purchase the tool. Later you can upgrade the tool by purchasing the license. Mobile Trans Lifetime License costs at $39.95. The primary usage of Mobile Trans is the transfer of Contacts, Messages, Calendar, Photos, Music, Videos and Call logs between Phones. It supports iOS, Android and Symbian for direct Phone to Phone transfer. In the case of, Blackberry to iOS or Android, we have to backup the Blackberry to Blackberry Desktop software Version 7.0 or 7.1. And that Backup can be restored to the desired device easily using Mobile Trans. Some people may think transferring the contacts is easy using various methods available online. But, they all transfer name and numbers only. Even those transfer of name and number is also not guaranteed with 100% in some methods. By using Mobile Trans, we can transfer 100% of Contacts. 100% means Name, Number, Job Title, Email Address, Company Name and others. I never know any tool that doing a transfer of Contacts with complete information like Mobile trans. What can you do other than Transfer from Mobile to Mobile using MobileTrans tool? Read further to know complete take care of Phone Data. Do you have only one Phone now and want to transfer the Phone’s data to another phone later? 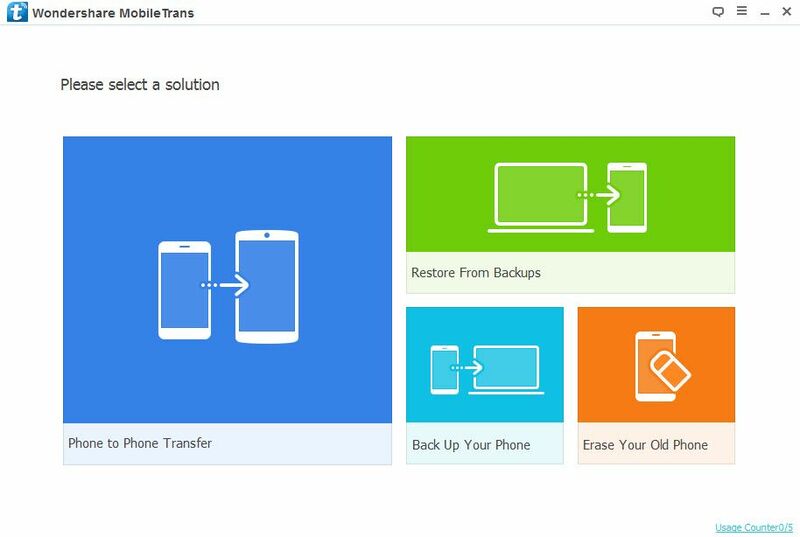 Mobile Trans can backup your Phone’s data now and later you can transfer it to another phone. People buying new Phone on an exchange of old Phone will get benefited using this feature. Also, those who want to backup their Phone’s data safe and secure can use this feature. 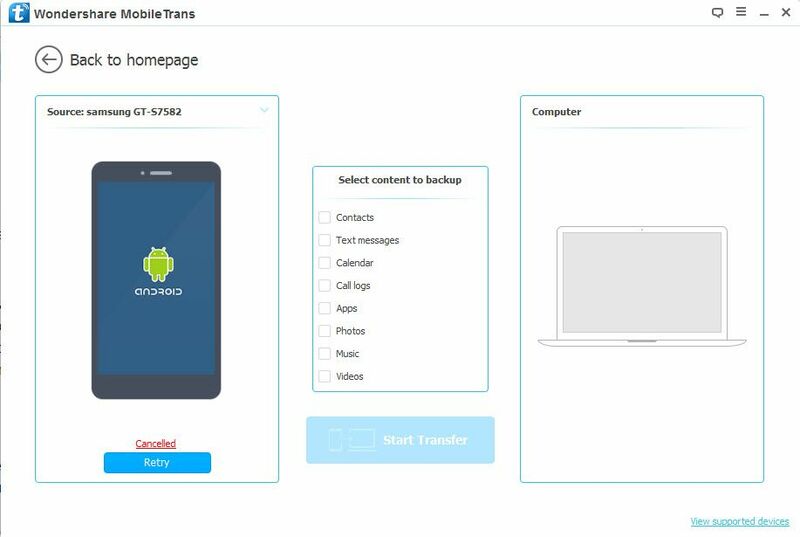 If you have a backup of your phone’s complete data in Mobile Trans, you can use it when your phone data erased accidentally or on the loss of a phone. The backup on Mobile Trans can be transferred to the iOS or Android phone easily. Also, you can retrieve the backup is taken from Samsung Kies, Blackberry Desktop Suite version 7.0 or 7.1, and MobileGo. Another most welcome feature is Transfer of iTunes and iCloud backup to Android or iOS. This feature breaks the barrier on using iTunes in Android. While we selling our Phone to some unknown person, we are getting into the risk of leaking all of the data, we stored on the phone. Even we erase the Data completely, it can be retrieved. To avoid that risk, Mobile Trans tool is giving the option to Erase the Phone data permanently. Erase not only the existing data but also the deleted data which stored on the Phone memory. After the Installation, open the Mobile Trans and click Start to get the Phone to Phone transfer screen. Connect your source device and the destination device to the PC using USB cable. Mobile Trans will detect your devices. Then you can see the transferable Content like Contacts, Messages, Calendar, Cal logs, Photos, Videos and Music from the Source device in the middle. You can choose the content you want to transfer from the list and click Start Copy. That’s it. Your Phone to Phone transfer will be over in few seconds or minutes based on the volume of the transfer. Connect the Device you want to backup, then select the Backup option from the Menu, then you will get the Backup screen. Choose the Contents you want to backup and click Start Copy. Connect the Device you wanted to restore the backup and select Restore option from the Menu, then you will get the Restore Screen. Choose the backup file format you want from the drop down the list and locate the backup file in your PC. Select the Content you want to transfer and click Start Copy. As we said above, you can transfer backup made from Samsung Kies, Blackberry Desktop Suite, iTunes, iCloud, MobileGo and Mobile Trans itself. Click the iCloud Icon in the Restore block, you will get the Restore from the iCloud backup screen. Log in to your iCloud account in the screen from Mobile Trans. Then select the iCloud backup which you want to restore from your iCloud account and download it to Mobile Trans. After that, connect your target device and Click Start Copy to restore the backup. Open Mobile Trans and connect the device in which you want to erase the complete Data. 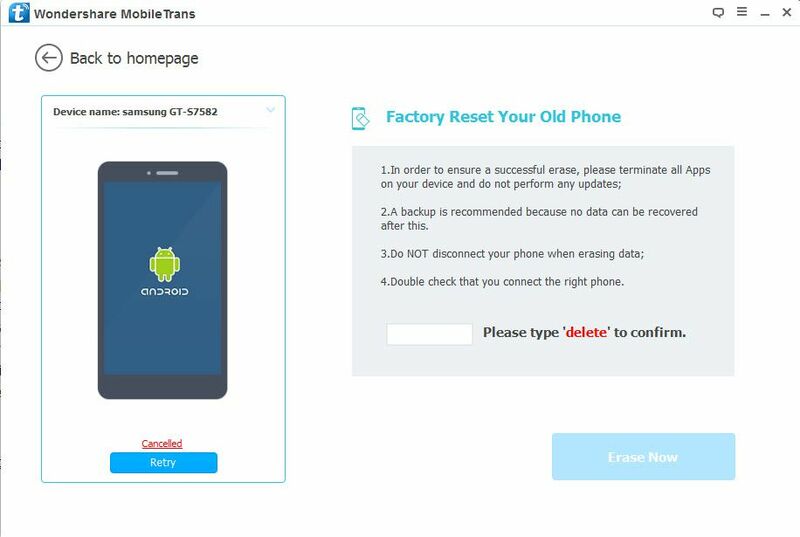 Click Erase your Old Phone in the Home page. Then click Erase Now tab from the screen appears. Then you will see a popup screen. Click Delete button on that screen to delete all the Data permanently. The usages of Mobile Trans is amazing. It is dealing with all the issues in Phone data transfer. Definitely innovative on that part. While people thinking about transferring at least the Contacts from One Phone to other, Mobile trans coming with solutions for transferring the complete Phone data. Who can reject a tool that features Phone to Phone Transfer, Backup to and Restore from PC, iTunes and iCloud to Phone transfer, Permanent Deletion of Phone data etc? The price is $39.95, which gives lifetime license of using Mobile trans and you can use up to 5 devices. The price is also reasonable when they give license to use 5 devices. We recommend Mobile Trans for Phone Data Transfers after our detailed analysis. Thank you for writing reviews about MobileTrans. I am Kathy from Wondershare. We have renewed our products Wondershare MobileTrans and changed its link into https: //mobiletrans.wondershare.com/. Please change the link into right one. Thanks for letting us know. The link is changed. This particular post is really very interesting. It has a really great peace of data. I enjoyed very well with this particular blog. It has very useful information and i like the style of this article. Thanks for the share. Thank you Jacu Frandus. We are happy to share more and more Tech information. Your comment is motivating us to do Hard work.